“Suppose lighting fires is just the tip of the iceberg?” – Doctor Joseph Wanless, from the film “Firestarter”. The culprits responsible for seven arson fires in East Bakersfield over the past two weeks were in Judge Erwin W. Owen’s courtroom today – and they were children! Acting on a tip given to him by Fire Chief Van Meter, city school attendance officer George Ruoff began an investigation. Van Meter told Ruoff that he had noticed that at each of the fires the same group of boys would gather to watch the arrival of the fire engines. Ruoff soon discovered that the boys had set all of the fires themselves. 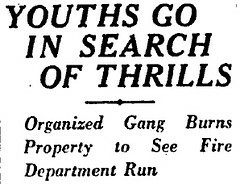 The gang of boys was led by an 11 year old who swore the members of his band to the strictest secrecy, admitting in court that they had deliberately set the fires “to see the fire wagons come out”. The gang’s leader was committed to a facility for youthful offenders in Whittier, and two of his lieutenants were made wards of the Juvenile Court. The remaining firestarters were turned over to their parents.